Shop All Modern and you can snag a free subscription to Dwell magazine! 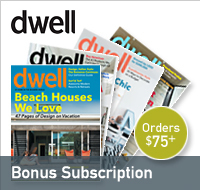 Get free shipping and a 10-issue subscription to Dwell Magazine when you purchase $75 or more. Like all wonderful things, some exclusions apply. AllModern.com is part of Wayfair and offers famous names like Alessi, Vitra, Heller, Missoni, Knoll, Kartell, Blu Dot, Artek, Steelcase, Umbra, Blomus and more. Or maybe you'd prefer to just purchase a subscription to Dwell?